Dark Knowledge, my new novel about New York City and the slave trade, is now at the printers; meanwhile, other copies are going out for pre-publication reviews. Once the book is printed, I'll publish excerpts here. Dark Knowledge won't change the world, so let's look at some books that either did, or tried to. · On July 4, simultaneous with countless backyard barbecues by others, and Joey “Jaws” Chestnut’s breaking his own record by gobbling 72 hot dogs in ten minutes in Nathan’s Famous Fourth of July International Hot Dog Eating Contest in Coney Island, I exercised my patriotism not by eating hot dogs (I know what's in them, loathe them) but by rereading the Declaration of Independence. · Visiting Paris on July 14, our illustrious president celebrated Bastille Day and so commemorated the French Revolution (the first; there have been so many). · Reading Helen Rappaport’s Caught in the Revolution: Petrograd, Russia, 1917 – A World on the Edge, I experienced the Russian Revolution as seen through the eyes of Westerners then present in the capital. · An article in the New York Times business section of July 14, entitled, “Tough Times for Disciples Of Ayn Rand,” brought that awesome champion of individualism to mind. · Reading in The New York Review of Books of July 13, 2017, an article by Peter Brooks entitled, “Something Grander Than a Novel,” I was reminded of Victor Hugo’s 1862 epic, Les Misérables. · Working on marketing plans for Dark Knowledge, my forthcoming novel about New York City and the slave trade, I was also reminded of Harriet Beecher Stowe’s novel Uncle Tom’s Cabin. What first comes to mind, when one thinks of books that change the world, are sacred texts like the Bible and the Koran. I haven’t read the Koran, though I did try recently (one needs guidance through its massive content), but of the Bible I recall above all a short passage from the Old Testament, “Where there is no vision, the people perish” (Proverbs 29:18, King James Version). This assertion I heartily endorse, and suggest that it does much to explain Hillary Clinton’s recent defeat; she had experience and commitment, but not vision, whereas Bernie and the Donald had vision to spare, as did Obama when he first campaigned in 2008. But this thought did not inspire this post, so on to those that did. Our Declaration of Independence is a document, not a book, but as a statement of a colony’s determination to achieve its independence it has inspired others and in this way has helped change the world. Our independence was made possible in large part by the intervention of the French, without whom the victory of Yorktown could not have been achieved. Bastille Day celebrates the people’s storming of the Bastille, a prison symbolizing the tyranny of monarchy. No small part in preparing the revolution was Rousseau’s Social Contract (1762), whose stirring first sentence, “Man was born free and everywhere he is in chains” has always resonated in my mind, as it has in the minds of many. And I can sing the Marseillaise, an anthem born of the Revolution, better than the Star-Spangled Banner, whose ups and downs in register defeat my modest vocal ability. Of course a few nasty details about the fall of the Bastille are all but forgotten For instance, there were only seven prisoners, the star detainee, the Marquis de Sade, having been transferred elsewhere ten days before. And the fate of the commandant, who was stabbed repeatedly and his head cut off and paraded about the streets on a pike. History is usually messy. The Storming of the Bastille, by Jean-Pierre Houël. If you look close, in the center you can see the unfortunate marquis, not yet headless, being apprehended. Reading Caught in the Revolution brings vividly alive the first days of the Russian Revolution in February 1917, which began as workers’ strikes and riots for bread in Petrograd, then spread as more and more people joined in, and became unstoppable when the Cossacks and military sided with the revolutionaries. Foreigners were treated well, Americans were respected for their country’s republican government, and the Marseillaise was sung in the streets. But once again things got nasty when, in the absence of any effective government, the police, and those suspected of being police, were brutally assaulted and lynched, their frozen bodies tossed into the likewise frozen river Neva, and other atrocities committed. Messy history again. While hunger and anger sparked the first demonstrations, Lenin would soon arrive to take charge, and one can cite Marx’s Communist Manifesto as another book that meant to change the world. Even if what resulted in Russia was a distortion of Marx, the significance of the book remains. Petrograd, July 4, 1917. 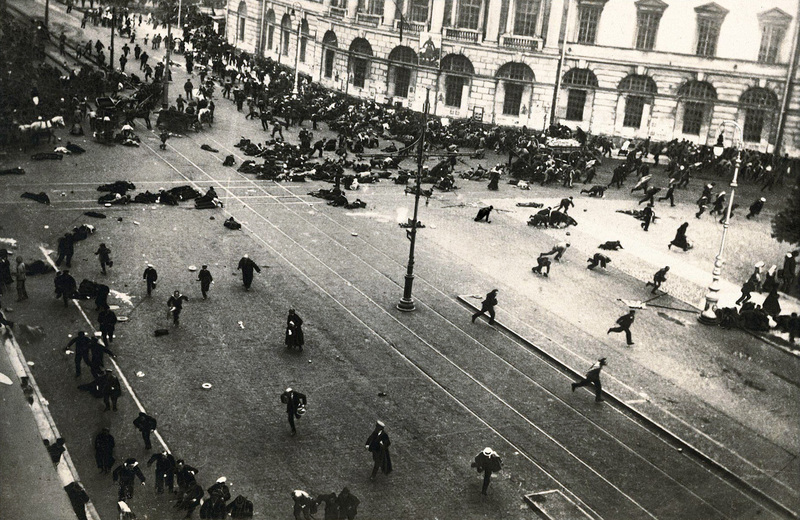 Demonstrators flee as the Provisional Government's troops open fire with machine guns. Another messy bit of history. Now we’ll get to some books that are the antithesis of Marx. The Times article of July 14 observes that our distinguished president, not noted for in-depth reading, calls Ayn Rand his favorite writer, and The Fountainhead his favorite novel. Having plowed through its 694 pages celebrating individual genius and decrying the mediocrity of socialist group think and consensus, I have trouble imagining our Twitterer in Chief, given his known inability to concentrate on one thing for more than ten minutes, achieving the same. But there is no question that Ayn Rand’s books capture the mind-set of the Trump administration. If ever there were books that the author intended to change the world, they are Ayn Rand’s two bestsellers: The Fountainhead and Atlas Shrugged (in my paperback editions, 694 pages and 1,069 pages respectively). And since Rand, born in Soviet Russia, knew the Soviet system only too well and wanted none of it, in this country she advocated the very opposite. But the Times article notes that some of her disciples have been less than brilliantly successful, resigning as CEO of their company or suffering other setbacks, for Rand herself never ran a company or prescribed in detail how an entrepreneur should run a business. Peter Brooks’s article rejects the frequent claim that Hugo’s Les Misérables is the greatest novel of the nineteenth century, noting how the author never really gets inside the main character, Jean Valjean. True enough, and Hugo’s penchant for grandiose gestures and oratory, which I have experienced in other works of his, do not endear him to the readers of today. I read Quatrevingt-treize (1793), about the royalist rising in Brittany in 1793, in my senior-year French class in high school, and chiefly remember the protagonist, the royalist Marquis de Lantenac, gesturing and orating flamboyantly at every opportunity. But Hugo’s Misérables is nonetheless a prime example of that new phenomenon, the international bestseller, having been translated and read all over the world. It came at the right time, when people were questioning a society – any society – that ignored the needs and suffering of its vast impoverished masses. Whether successful or not as a great novel, it had its impact and went far in attempting to change the world. It’s no coincidence that it inspired a successful musical that premiered in Paris in 1980 and played on Broadway for years. From a 1920 French film of Quatrevingt-treize. That character on the left has got to be Lantenac, which says a lot about why Hugo's novels may not fly today. edition of Les Misérables (1862). A man you'd love to hate. I read Les Misérables long ago in, of all places, Anchorage, Alaska, where I spent the summer of my junior year in college working in a kitchen feeding civilian workers on an army base. Desperate for reading, I haunted the public library, meanly housed in a quonset hut while the city basked in the glory of a second downtown street being paved. When I ran through all the library’s minimal offerings in English literature, I clutched at French titles in translation. So I was soon on the barricades with young Marius, and followed Jean Valjean as he carried the wounded young man through the sewers of Paris, the passageway at one point descending perilously into the murky waters before rising again. And of course I came to loathe Inspector Javert, the police officer who pursues Jean Valjean relentlessly over the years. Perhaps in my desperation I relaxed my standards a bit, but Hugo’s epic held me to the end. Whether it would today, be it in French or in English, is another matter. Could she have started that big war? Finally, we come to that other nineteenth-century bestseller, translated into many languages and even inspiring a dramatic rendering, so Broadway would have it, at the royal court of Siam. Like Hugo’s novel, Harriet Beecher Stowe’s Uncle Tom’s Cabin (1852) came at just the right time, when this country, having dodged the issue for decades, was facing at last the problem of slavery and what to do about it. Neither Stowe nor her publisher anticipated its incredible success – 300,000 copies sold in the first year alone. When, at a White House reception during the Civil War, she was presented to President Abraham Lincoln, he said, “So you’re the little woman who wrote the book that started this great war.” A simplification, if true (the story is considered apocryphal), but there is some truth in it. For all its faults and shortcomings – no one would call it a literary masterpiece – it is a book that helped change the world. I have tried to read Uncle Tom’s Cabin twice but both times gave it up; it never got hold of me the way a really good novel should. Just reading a synopsis of it, with its many characters and endless turns and twists of plot, wears me out. And the scraps and pieces that everyone knows, or knows of, can be off-putting: Uncle Tom himself, now a symbol of rank subservience; the tear-inducing death of little Eva; and the demonic slaveowner Simon Legree, villain of villains, who has Tom beaten to the point where he departs this earth a Christian martyr. I always imagine Legree as the stereotypical villain of nineteenth-century drama, a towering figure in black, tophatted, who twirls his snakelike mustache with vicious delight. Yet when I once read, as an excerpt, the account of the fugitive slave Eliza clutching her infant as she crossed the ice-filled Ohio River to freedom, I was moved. For us today Stowe’s epic is more a creaky historical document than a piece of literature, but at times the darn thing blazes. Eliza crossing the ice with her child. An 1881 theater poster. From reading an excerpt, I remember the ice floes, but not the dogs. So much for my list of books that changed the world, or tried to. What titles would you add? If I’ve left out something obvious, tell me. Coming soon: WHY I LOVE NEW YORK.